Being that my father is a baker, we always had bread around the house growing up. One of the things he would make would be homemade garlic bread. Everyone knows this pairs up great with a pasta dish and a glass of vino. This recipe is simple and the fresh herbs really stand out. 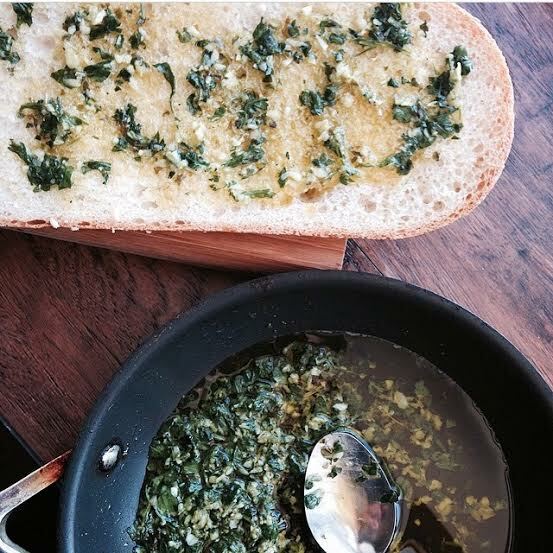 Once you try this you will never want frozen garlic bread again. Enjoy! Now in a small skillet on medium to high heat add olive oil. Next add your fresh herb mix. Cook for about a minute, you don’t want garlic to burn. Take the bread and cut in half. Place on top of a baking sheet. Smear the butter on the slices. Next take your olive oil and herb mix and smear it on top of the butter. Turn your oven now to broiler. Add the bread. Should take 5-6 minutes until bread is toasted and golden brown.